Facebook is now the most popular site in the U.S., according to analytics firm Hitwise. 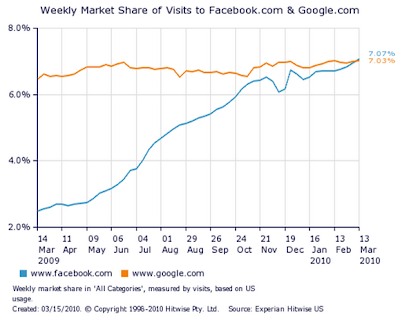 In the week ending March 13, 2010, Facebook surpassed the previous most popular site, Google, in terms of overall traffic for the week. Looking at the graph above, it’s clear that Facebook has seen a steady rise in traffic since last year. Traffic to Facebook increased 185 percent compared to the same week last year, whereas visits to Google increased only 9 percent. Alot of this traffic is coming from the social games ie, Zynga, etc. Farmville alone has more than 83 million registered players.